One of the few manufacturers of incline trainers, the NordicTrack incline trainer line is what other treadmill brands should look to if they want to create an incline trainer. These machines are powerful treadmills with huge incline ability, which sets them apart from other incline trainers currently on the market. The incline trainers have several features that are common in this line. Something to consider when you are thinking of purchasing an incline trainer is that these are not small machines. They take up quite a bit of space and do not fold up. NordicTrack incline trainers are pretty heavy and take at least 2 people to move safely. So be sure you have dedicated space in your home if you choose to purchase a NordicTrack incline trainer. 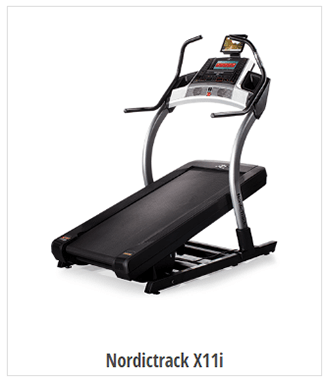 The NordicTrack X9i is the introductory incline trainer currently available on NordicTrack’s website. 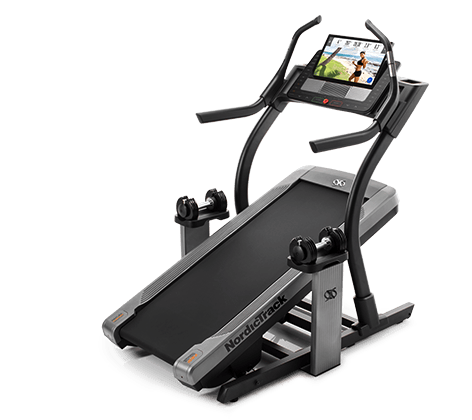 It has many of the great features available in NordicTrack’s Commercial line matched with the great range of an incline trainer. Enjoy the well-cushioned deck while you workout with the variety of programs offered on this machine. Striking a great balance between price and features, the NordicTrack X11i incline trainer will help you push your limits. There are two sets of handlebars which you will definitely need as you crank up the incline setting on this machine. To make sure you are working out as intensely as you think you are, be sure to put on the heart rate monitoring chest strap. The most luxurious of the incline trainers, the NordicTrack X22i will make you want to workout. The huge, 22” HD touchscreen was meant to help you jump fully into whichever of the 44 built-in workouts you choose. Your incline trainer will automatically adjust and you will be able to utilize the massive incline range to the fullest. Add an iFit Coach membership can also allow you to virtually run around the world, creating a more immersive experience. NordicTrack has been creating quality cardio equipment for decades and their current lines are no exceptions. There are other incline trainers out there but they lack the features NordicTrack has available. They don’t have the same large incline range and many others are incline-focused with no ability to work as a regular treadmill. If you want to check out other quality offerings by NordicTrack, be sure to read up on the NordicTrack C Series and the NordicTrack Commercial line.